Beautiful inside and out, New York socialite Judy Lovin values family over fortune and fame. So when her father’s business collapses and his most powerful enemy offers to help — in exchange for Judy’s company — she agrees to join John McFarland on his remote Caribbean island. It isn’t long before she discovers that John’s far from the beast he seems to be! Some Kind of Wonderful was a modern retelling of the classic Beauty and the Beast tale. 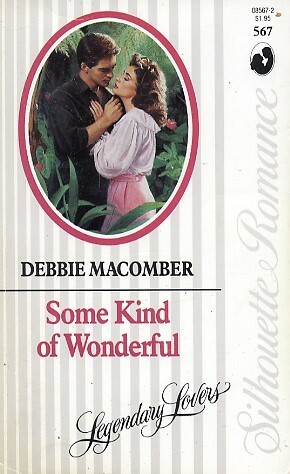 However, it just didn’t satisfy very well in comparison to the Macomber’s work with her Cinderella retelling in Cindy and the Prince. The “Beast”, John McFarland, was truly horrible to get along with half the time. This made liking him and seeing his “love” for Judy as a little far-fetched at times. Maybe he tolerated her because she was “nice” and all, but falling in love? I just didn’t feel the chemistry very well. It also didn’t help make matters any better as I didn’t particularly love the protagonist. Sure, she’s kind and sweet to children, tolerant of John and truly cared for her family enough to do what was needed, aka a huge sacrifice on her part. But, even with all these attributes, she was…two-dimensional. She didn’t feel very real to me. Maybe because she was too perfect? I don’t know. But this story has left me with a strange taste after finishing it. Although a rather quick read, possibly because it was a little too short to gather much momentum, this modern retelling was by far lackluster, even given a second read. It doesn’t get better, and the unbelievability of such characters made it hard to fathom the depth of their “love” for each other by the end of the story. Just take it at face value in trying to maintain some of the dynamics seen in the classic Beauty and the Beast, and maybe that would be enough to help digest this.